DuMor products are placed domestically and internationally in a wide variety of venues. In Pennsylvania, the company’s creations can be seen in places like Hersheypark, Penn State University, and the City of Pittsburgh. Nationally, DuMor products are located in places such as Walt Disney resorts and parks, Ruby Tuesday restaurants, Riverwalk, the Memphis Zoo, and the City of Boston. DuMor, Inc., a proud U.S. manufacturer of site furnishings, was founded nearly 30 years ago based on the steadfast belief in providing the best quality product. This tradition of attention to quality along with DuMor's commitment to providing superior customer service continues today and makes DuMor one of the leading names in the site furnishings industry. Over the last 29 years, DuMor, Inc. has grown steadily and now operates in a facility totaling nearly 85,000 square feet. 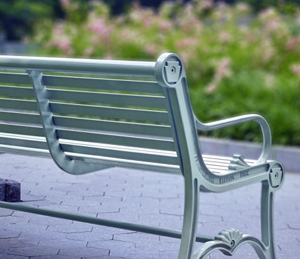 Its standard product line has expanded to include over 68 bench designs, over 27 receptacle designs, more than 18 table designs as well as planters, ash urns, bollards, bike racks, and grills in a full range of colors and materials such as wood, steel, and recycled plastic. One of DuMor’s additional strengths is the ability to design and produce custom pieces.